Buiten Westen, the cultural festival for ‘free minds and free sounds’, will return to the Westerpark on July 20th of 2013. With a programme filled to the brim with musicians, artists, culinary craftsmen, actors and other young creatives the beautiful park promises to become a meeting point for Amsterdam’s creative talent and culture lovers once again. Six young creative collectives take care of the musical side of the programme by each hosting a stage: Pleinvrees, Rekorder, Next Monday’s Hangover, BlackOut, PaardenKracht and VBX. Electronic dance music is the main ingredient of this event and these youngsters know exactly what’s going on in this world. The ears are not the only senses being tingled though; decoration, art and the non-musical programme are equally important at Buiten Westen. Thee names are still missing on the Pleinvrees poster, but we can already reveal that these mysterious guests will be real Pleinvrees superstars. Loyal fans will know in what direction to guess.. Already revealed is returning Frenchman Joris Delacroix who’s summery live-set will make the sun shine once again. The rest of the stage is dominated by a big contingent of Germans: Alle Farben, Wankelmut and Oliver Shories. Local ‘hero’ Bakermat rounds up the bill. Rekorder stands for house music without borders. Frenchman Agoria of the famed Innervisions label will be one of the men responsible for taking care of this, but the Italians Clockwork, the German Adam Port and the Swede Sebastian Mullaert of Minilogue are also guaranteed partystarters. Locals De Man Zonder Schaduw, Wouter de Moor, Marcus Gehring have the heavy task of flying the Dutch flag, but they are more than capable of outshining anyone. Disco something of the past? Hell no! PaardenKracht might be the most ‘gezellig’ parties of Amsterdam, known for single handedly responsible for turning unicorns alive. House king Prins Thomas heads the bill but not alone, Maxxi Soundsystem, Tiger & Woods, Tom Trago, Homework, SHMLSS and Vriendje van Ferry will all have their disco and nu-disco records ready for a spin. BlackOut is the house concept focused on quality by the immensely popular Dekmantel collective in cooperation with resident DJ Michael Jacques. They once again showcase their expertise this year, by bringing artists to the stage such as Danny Daze, Huxley, William Kouam Djoko, Bob Nagel and Cobblestone Jazz. The lastly named being a very special jazz-house improvisation trio fronted by techno legend Mathew Jonson. Head honchos Thomas Martojo, Caper Tielrooij and Michael Jacques are also present of course. The news that Next Monday’s Hangover would make its Buiten Westen debut with an indie-electronica stage already created a lot of speculation on Facebook. Here are the names: Pachanga Boys, Kölsch LIVE, Daniel Bortz, Nuno dos Santos & Miss Melera, Dirty Doering, NU & Acid Pauli and Some Chemistry. Deep melodic music is what they promise, and with these names that looks like a guarantee. VBX is the new name of Vrijbuiters, the collective known for hijacking ferries and bunkers in Amsterdam for underground parties. 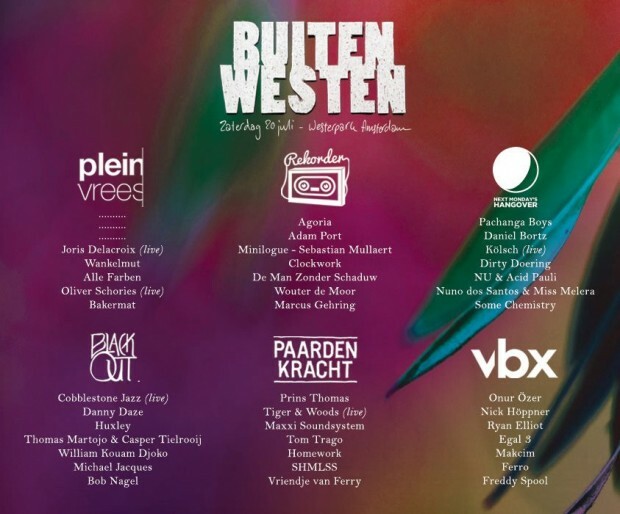 They are back at Buiten Westen in a slightly renewed form, with local and international DJs such as Onur Özer, Nick Höppner, Ryan Elliot, Egal 3, Makcim, Ferro en Freddy Spool. The underground club sound is coming to the open air. Literally the sharp edge of the festival.